LOS CAB LIFE T H E O F F I C I A L P U B L I C AT I O N O F L O S C A B S P O RT S V I L L A G E F E B R U A R Y 2 0 1 9 LET THE GAMES BEGIN! CLUB CHAMPIONSHIPS LET THE GAMES BEGIN! 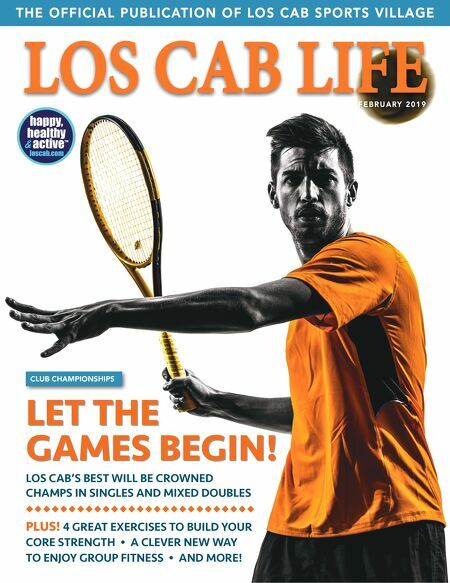 LOS CAB'S BEST WILL BE CROWNED CHAMPS IN SINGLES AND MIXED DOUBLES ◆ ◆ ◆ ◆ ◆ ◆ ◆ ◆ ◆ ◆ ◆ ◆ ◆ ◆ ◆ ◆ ◆ ◆ ◆ ◆ ◆ ◆ ◆ ◆ ◆ ◆ ◆ PLUS! 4 GREAT EXERCISES TO BUILD YOUR CORE STRENGTH • A CLEVER NEW WAY TO ENJOY GROUP FITNESS • AND MORE!